To start my 2 week journey back to Iceland, I flew from Cancun to Miami, which I had never considered that similar, but they definitely gave me a familiar feeling. The downtown area and beautiful beaches could verywell have been side by side, and the only real reminder I was in the USA was the big, multi-lane highways covered in shiny, new cars and oversized SUV´s. 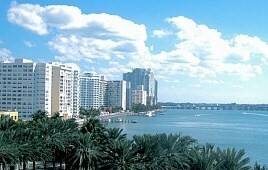 The Miami airport was almost totally employed by Spanish speakers, and even when I got to South Beach, many were still speaking Spanish. I just resorted to asking questions to retailers and bus drivers in Spanish again, and that went flawlessly. Different to the rest of Central America, people actually thought I was latina, so people assumed speaking to me in spanish was totally normal. 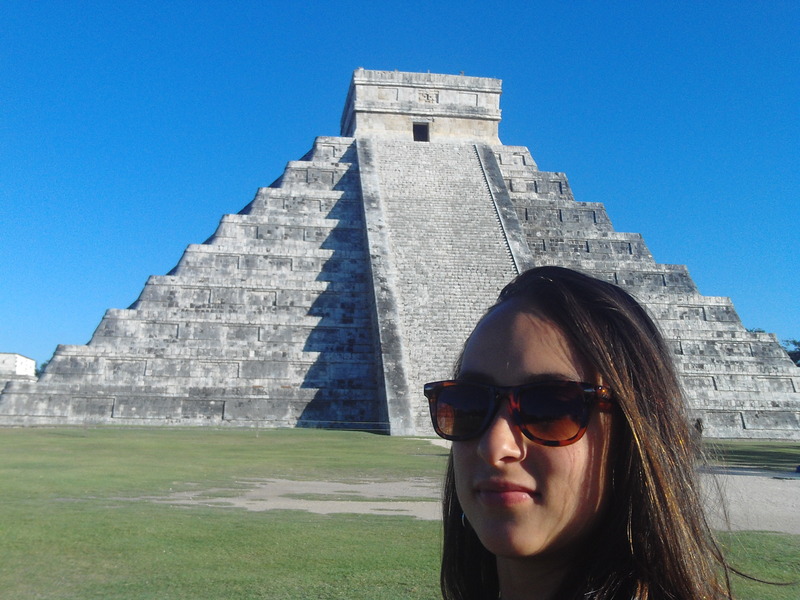 I guess I wasn´t that far off from being confused at how everyone knew I was a gringa during my trip. Miami beach was shockingly cold, so even though Mexico hadn´t been that warm, sitting and starting out at the Caribbean Ocean on one of the sunniest days with temperatures at 5° C was really hard to comprehend. It was like a postcard picture of everyone´s expectations for South Beach, but then totally deserted except for a few people dressed in winter clothes and seagulls hovering way to close for comfort since I was the only person with tortilla chips in my hands. I was wearing my 2 month old tattered clothes, jeans with holes in the legs, a summery shirt, and flip flops, so I certainly wasn´t prepared for the weather. I also wasn´t dressed for walking around Lincoln Road Mall, since everyone was super hipster, fashion savy and dressed to kill, some even appropiately warm for the weather – I didn’t know Floridans (Floridians?) had winter fashion. I decided to go into a clothing store and buy an entire new outfit, and came out, successfully, with new boots, jeans, a sweater, a scarf, and a faux-leather jacket. I left my old outfit on the top of a garbage can, just incase anyone would have any use for it. Belize is a tiny, carribbean-coast country in Central America, the only one that does not include spanish as its official language, and probably the most ethincally diverse and mutli-cultural place. It’s a fusion of ex-colonial British influence crossed with the reggae-rhythm lifestyle of the West Indies, and a dash of latino mixed into everything. 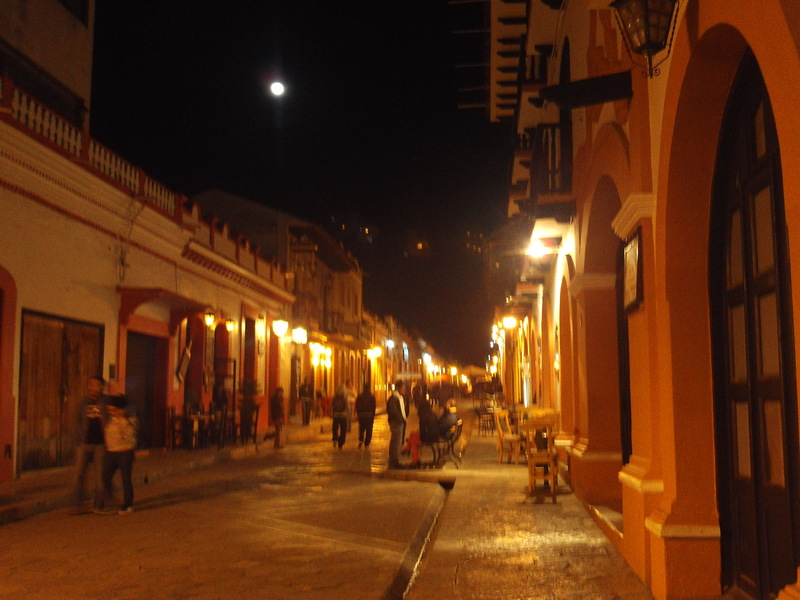 The architecture switched from the one-storey concrete blocks typical in Spanish colonial towns to the two-storey, stilted, wooden houses encircled by verandas, less subtly affected by annual hurricane damage. Even though it was by far the most expensive place, poverty was still severe, but the extreme class separations seemed more balanced. They say Creole English is the spoken tongue, but I’m not sure how long you can call a language a dialiect of English if it develops into a completely new way of speaking, incomprehensible to most native ‘English’ speakers. The super-thick accent, rapid but lazy way of speaking, and the number of novel slang words made it tough for even me to understand, even though I grew up with my Mom and Grandma speaking Creole English from Guyana. 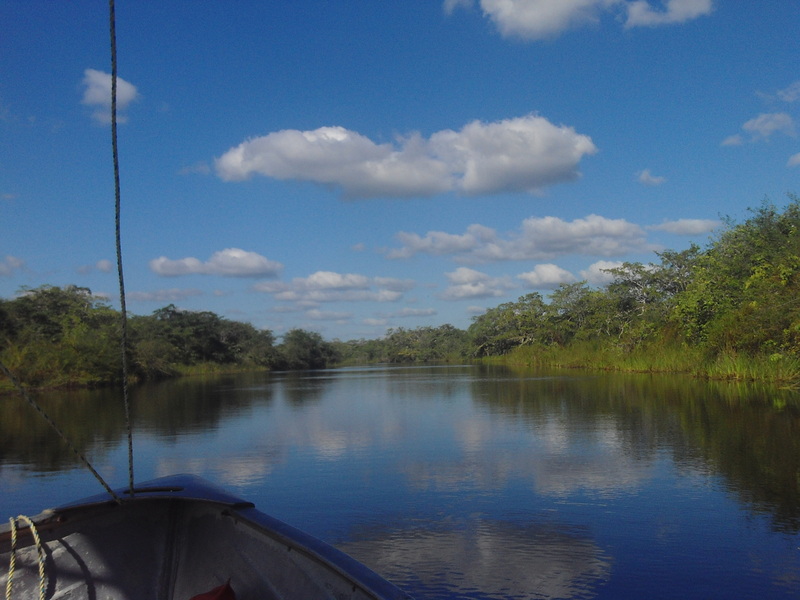 I spent all my time in Belize on water, mostly on the coast but also on the New Belize river to see Lamanai. 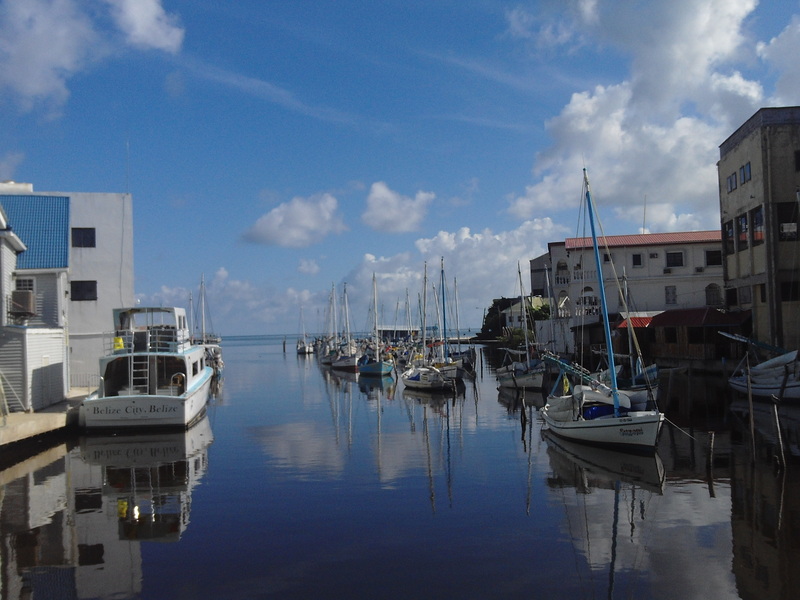 I spent one day in Corozal, in transit from the cayes to Chetumel, Mexico. I thought it would be more tourist-friendly than it was, but upon arrival realized there was only one budget place to stay at $20US per night. The Sea Breeze hotel turned out to be one of my main Belizean highlights, since the owner decided a hefty discount, a complimentary bar tab, and breakfast included would be the proper way to treat a solo-lady traveler nearing the end of an over-budget trip. He was an older guy from Wales who decided to retire to Belize and run a hotel after spending his golden years managing some amazing rock bands like Phish, the Grateful Dead and The Who. I also couldn’t get enough of the hot, pressurized shower, a queen sized mattress all to myself, and the shining white, clean towels and sheets. 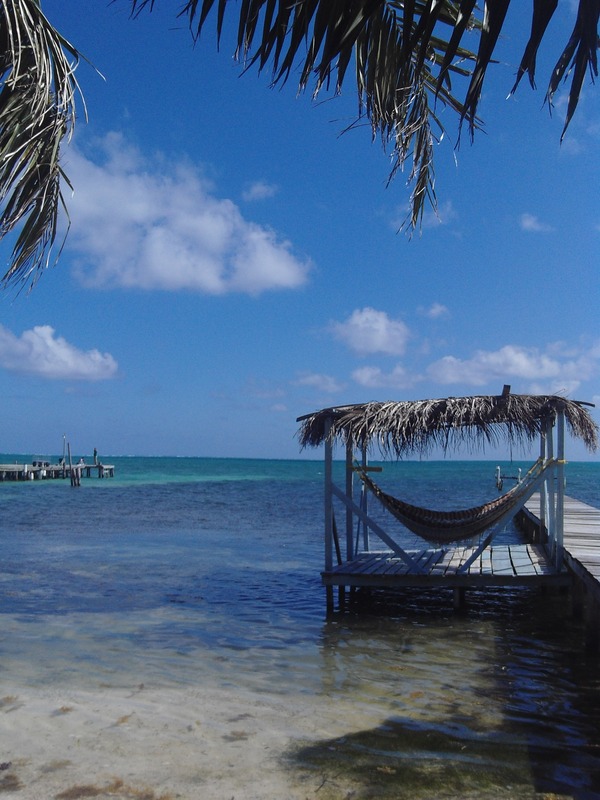 who wouldn't want to hammock in Caye Caulker? In the north east I spent some time in Belize City, but unfortunately planned my entire day there on a Sunday (its a pretty religious population) which meant everything was closed an even the main streets at midday were ghosttowns. From there I took a 1 hr motor-boat taxi to the caye’s, and instantly felt like I was surrounded only by sand and tropical ocean. Caye Caulker is basically just a mile-wide strip of sand surrounded by ocean along its 5 mile length, and an altitude of maybe a couple metres above sea level. There are only golf carts or your own two feet to get around, and you’ll quickly get to know all the locals that line the main streets trying to sell you today’s catch for dinner. During the day tourist guides and shop vendors all shout out hello to you, wanting to know how you are, directing you to walk slow, or just flatter you with compliments until you give them a big enough smile. All the houses were pretty colourful, and the resident population is probably always dwarfed by the constantly renewed tourist population, but somehow it maintained a really local, laid-back vibe that anyone picturing a small-island getaway would consider perfect. Crossing into Mexico was one of the stranger borders, since you leave Guatemalan customs in La Mesilla and then need to take a taxi 3 km to Ciudad Cuauhtemoc to officially enter Mexico; which country are you in for those 3 kms? No man’s land I guess. I went from the border town another 3 hrs to San Cristobal de Las Casas, a fairytale colonial city that actually made me think I was in Disneyland a couple of times. It’s located in Chiapas, a state full of mountains, ecotourism, Mayan history and an unexpectedly cool climate. The backdrop of the cobblestone downtown is Cerro de la Santa Cruz, a small mountain with steps leading all the way to the top where you can find a church with the most beautiful view of the city, and the biggest, more patriotic Mexican Flag you could ever imagine. There are 31 states in Mexico, and it’s a huge country, but funnily enough its often not included in talk of North America or Central America, so it’s just kind of in its own league. Respectfully so, though, since just the state of Chiapas has over 100 languages spoken by all the different indigenous groups, a testament to the countries rich and complicated culture. Nothing was really that different for the first couple of hours driving into Mexico, but it slowly became obvious I was somewhere new when the roads stayed consistently safe, American tourists were numerous, people didn’t speak just Spanish (usually English or some indigenous dialect), and I saw a Wal-Mart supercenter in the middle of the countryside. I also thought it was awesome that there are actual places in Mexico called Tabasco, Jalisco, and Tequila, and that stray chihuahua’s replaced the non-descript, middle-sized dogs I had gotten accustomed to. 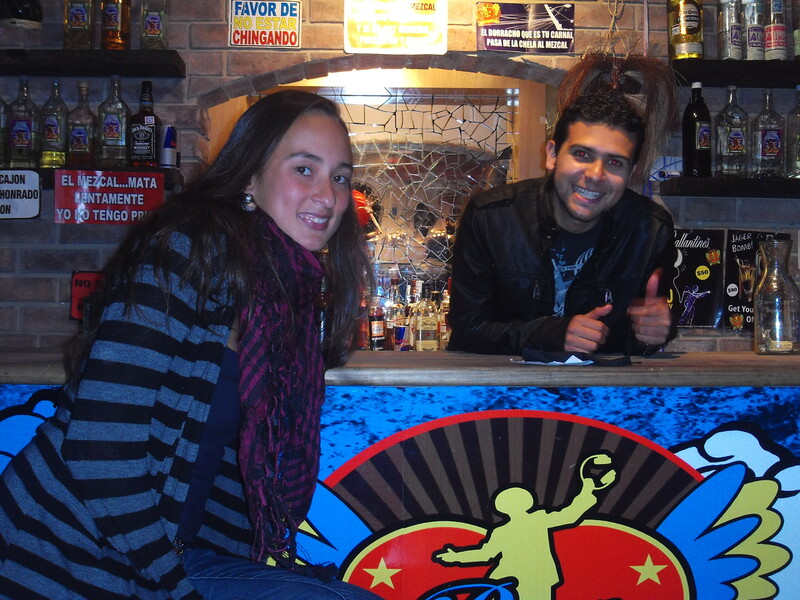 I couchsurfed some more in Guatemala and Mexico and the host I had in San Cristobal de las Casas was a young guy who worked for the Ministry of tourism, lived right downtown, and ran a bar on the main nightlife street with friends of his. He was such an awesome host, and as it turns out, we ended up having a mutual friend in Oregon since he went on a Rotary exchange in highschool to Eugene and met Clare, my former Semester at Sea (fall 2006) classmate Ryan’s girlfriend who I stay with when visiting Oregon. Small world. I didn’t spent much time in Chiapas since I was mostly taking the huge detour inland to see Palenque before making my way back to the Caribbean coast. 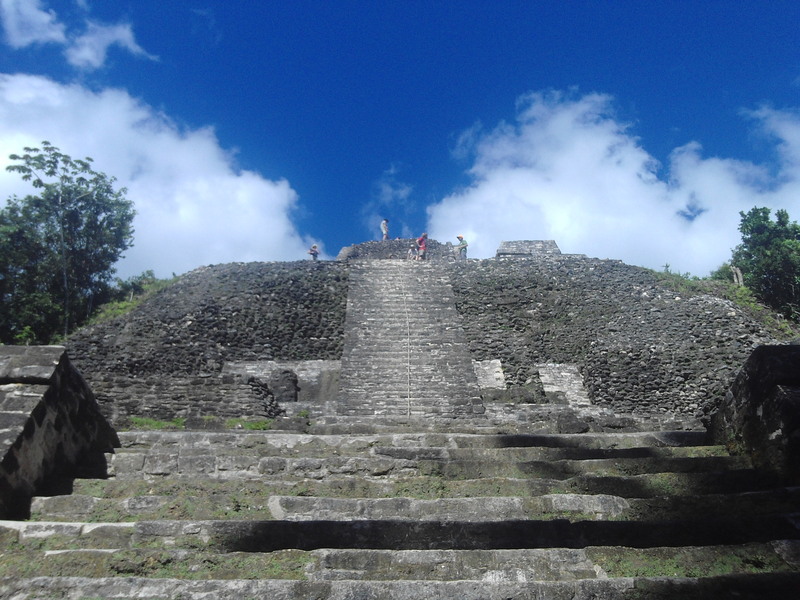 I crossed back into Belize before going north again, through Chotumel and straight into Tulum, a big backpackers. There’s a beautiful coast line there, speckled sparcely with resorts, a mayan site, and lots of cenotes. I stayed at the Weary Traveler hostel, which was cheap and included a mediocre breakfast, but offered a stiff atmosphere and an overly complicated way of managing its guests – if you’re there soon, I highly suggest taking a bus or a cab out to the coast and paying $5 to sleep in a hammock on the beach. 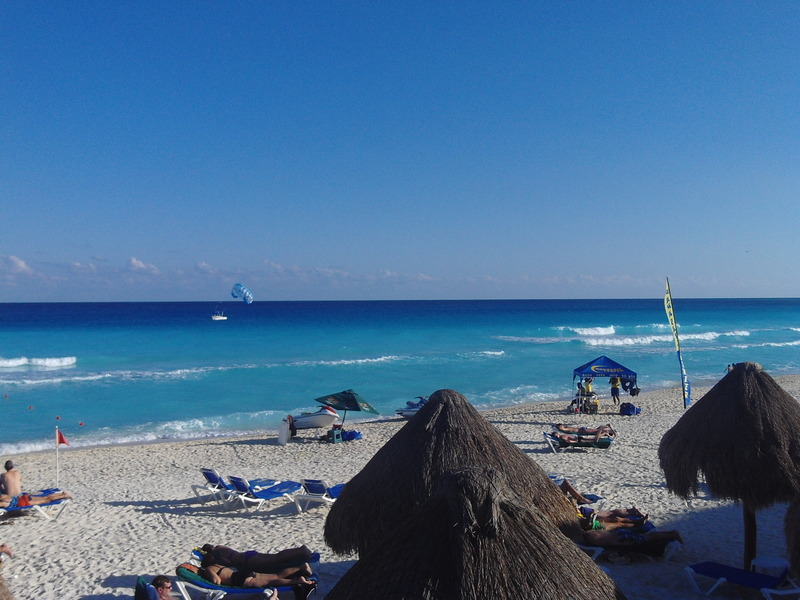 I spent a few days in Playa del Carmen and Cozumel, both overridden with middle aged or retired cruise ship passengers, mostly Americans or Quebecois Canadians. They all port off just for a day, with the assumed goal of shopping til they drop, buying all sorts of Mexican souvenirs, cheap alcohol, and overpriced jewelry. It was fun to hear all the Spanglish exchanges, since every tourist just knew a little Spanish, and most of the vendors knew enough English, but together they spoke thi hilarious Spanglish to negotiate just the right price. 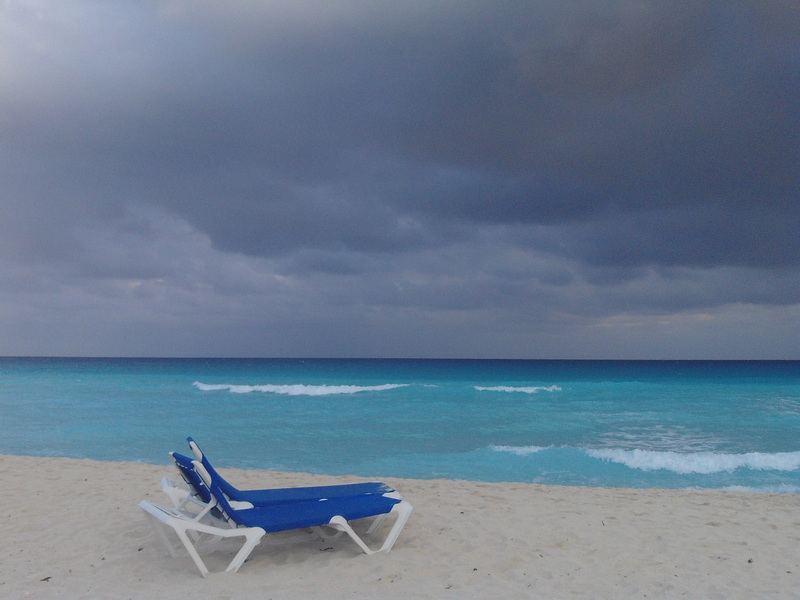 I ended my trip in Mexico in resort-filled Cancun. Ending a two month backpacking trip in central America there was a little ironic, very expensive, but totally practical for flight purposes. I was spoiled by being put up in an all-inclusive resort for 2 nights, a strange thing to do alone but almost even more luxurious that way, and spent most of my time writing, drinking specialty coffees with Kahlua, and swimming in the ocean or the pool, depending on how salty I wanted to be. It was a prefect middle point between Central America and Miami, where I flew to after leaving, slowly readjusting me to American culture, more spoken English, and the gradual drop in temperature and loss of sunlight hours I felt while heading North. 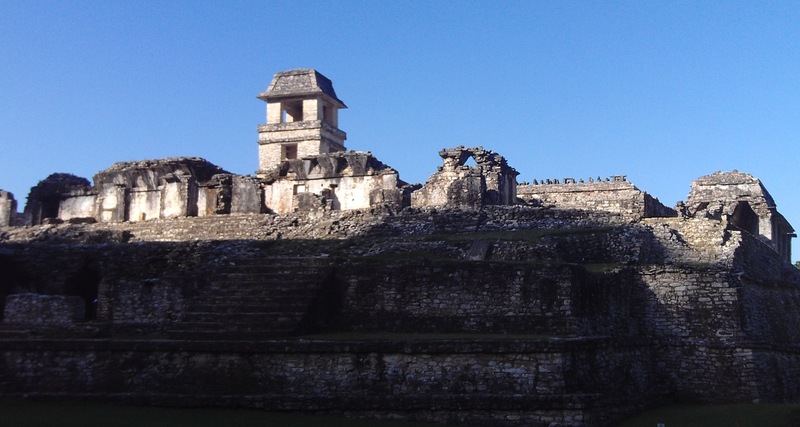 My first site was Copán Ruinas, in Honduras. It was super impressive, probably because it was my first Maya site and it did look just like what I hoped the ruins to look like. The surrounding lawns were well maintained, so it was hard to picture the place a thousand years ago – was it thick jungle, totally clear, covered in livestock or crops, or equally groomed? It was also really hard to picture the temples any colour but grey stone, but apparently the buildings were sometimes elaborately painted and decorated. Copan was the most expensive ruin site, costing $15US for entry, and another $15 to enter the tunnelways underground. A guide cost even more, so I didn’t quite get the full experience only walking around the outside grounds, but was much happier to enjoy them in the unexpected quietude of only a few other people sharing the entire site. My second visit was to Palenque in Mexico, which sat in dense vegetation, elevated a little above the town of Palenque, perched on the hillside 8km away. It was bigger, had more freedom for climbing the ruins, and was better maintained and restored. It was busier, with hundreds of tourists bustling around, and dozens of market vendors lined the walkways selling all the same things, easily distracting me from looking up and around at the much more important temples. My third site was in Guatemala. Tikal as a tourist destination was very organised, with San Juan tours monopolising almost all the tours and bus transportation to the isolated destination almost 40 km from any towns. 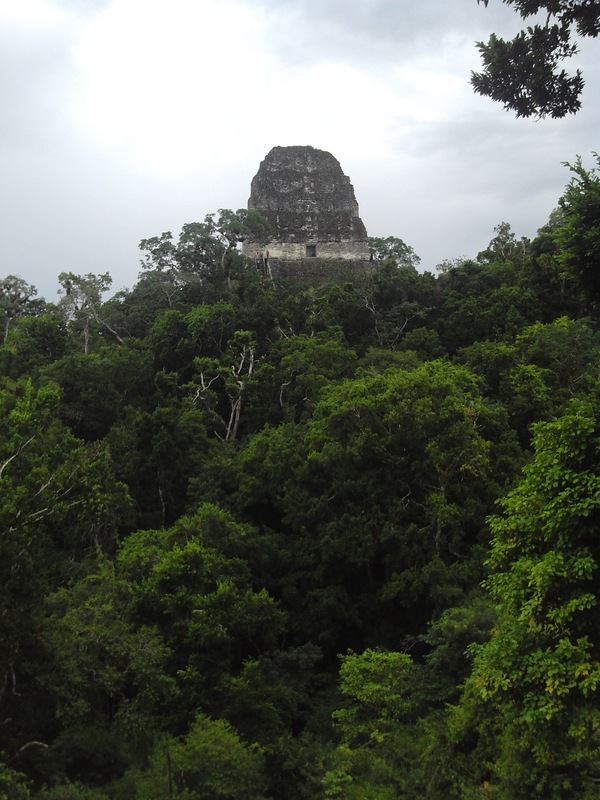 However, when you got there, you were dropped off to the entrance of a 15km2 densely vegetated park scattered with ruins all over and temples rising way above the jungle canopy visible only from the tops of each other. It was so wild, with entire 3 storey temples completely buried in new vegetation with hundred year old trees rooting on top of them. Only about 20% of the entire site has been excavated, so I can’t wait to go back there in 25 years to see what it looks like then. My fourth site, Lamanai, could only be reached from Orange Walk by a bumpy dirt road or a 2 hr motor boat ride down the Belize New River. I went to the ruins with a local and his wife who agreed to drive me the hour and a half in a sedan for $35US, and met up with a tour group there that Jungle River Tours from Orange Walk organised for me to have a guide and ride back to town with. It was the only site I had a guide and it definitely gave a totally different experience; instead of walking around gawking at the big temples wondering what it looked like before and what the people did back then, the guide basically explained everything he knew to paint a perfectly clear picture of how it might have been back in the 600’s. The boat ride back might have been the highlight, since we saw lots of birds, water lilies, crocodiles and even a pair of very friendly spider monkeys – one even came in our boat to steal a couple of our leftover bananas. 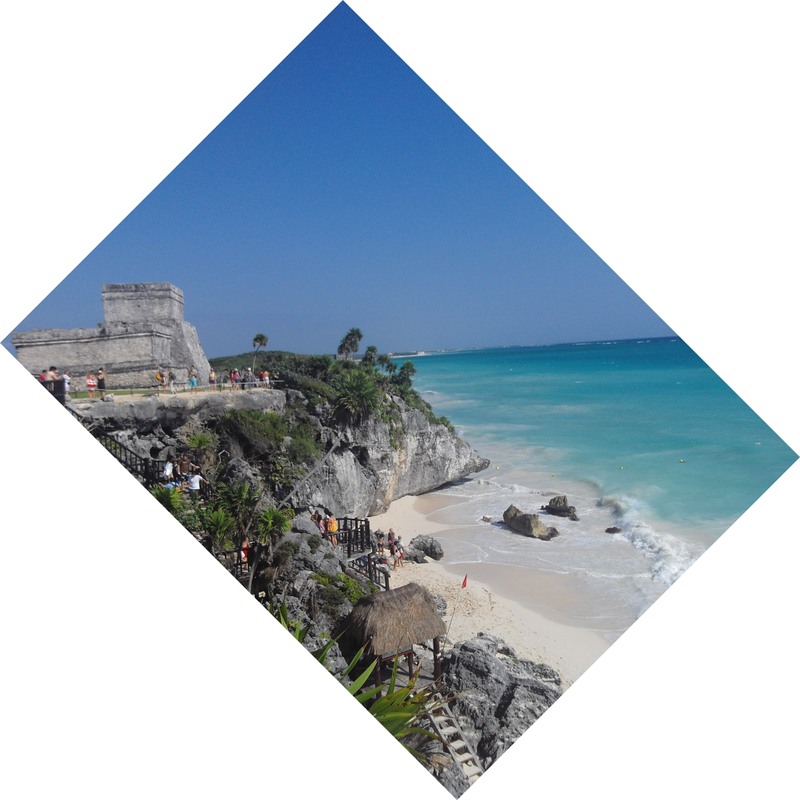 Tulum was totally different than the other ruins by being located right on the coast. Instead of a jungle environment, they were perched right over the most tropical, baby blue water and white sand beaches, with palm trees swaying in the perfect Caribbean breeze. The site was small and so were the buildings, so it was certainly crowded with the hundreds of people visiting, but it was still a pretty place to visit for a morning. My final visit was to Chichen Itza, a way of saving the best for last, since this site had so many different era’s and types of archaeological ruins, scattered over a pretty big area, but still small enough to walk and see everything in a day.The main temple, now one of the 7 new wonders of the world, was really majestic, sitting huge and ameliorated in the middle of a big, open lawn with people from all corners of the world surrounding it, trying to take that perfect portrait with Chichen Itza to take home and show all their friends. All the walkways connecting the older ruins to the main temple and the main temple to a beautiful cenote nearby were lined with vendor after vendor, who would call out to every passerby “almost free,” advertising their cheap prices. They did sell little trinkets for 10 pesos (less than a euro or dollar) and the one time I responded, jokingly but cheekily, “I only shop for free stuff,” the vendor put a handcarved wood statue in my hand and said “enjoy with your family.” This of course but a big smile on my face, and I thanked him with a hug and a picture together. It was certainly a better tactic than others asking “hey lady, something for your boyfriend?” *short silent pause* “somthing for your ex-boyfriend?” I would always politely dismiss the first, but couldn´t help but laugh out loud at the second question. Me, Claudia and Guy rode horses to the Guatemalan border from Copan, and even though we almost lost Claudia from her asthmatic reaction to both the horses and not being used to riding (sorry, Claudia), I’d still recommend it as an awesome mode of transportation to anyone traveling in Central America since it gives you so much more time to appreciate and absorb the landscape passing by. There are so many cornfields covering every inch of agrable land, and since the season just ended, they stand as dying, drying golden stocks that have all been handpicked since there’s no way a machine could navigate the steep, uneven hills they cover. Our first city we visited was Chiquimula, somewhat of a transit hub so we passed right through, but it will forever be remembered as the cheapest place to buy cigars. I bought about 40 hand rolled, Guatemalan cigars for $2, $0.05 a piece. 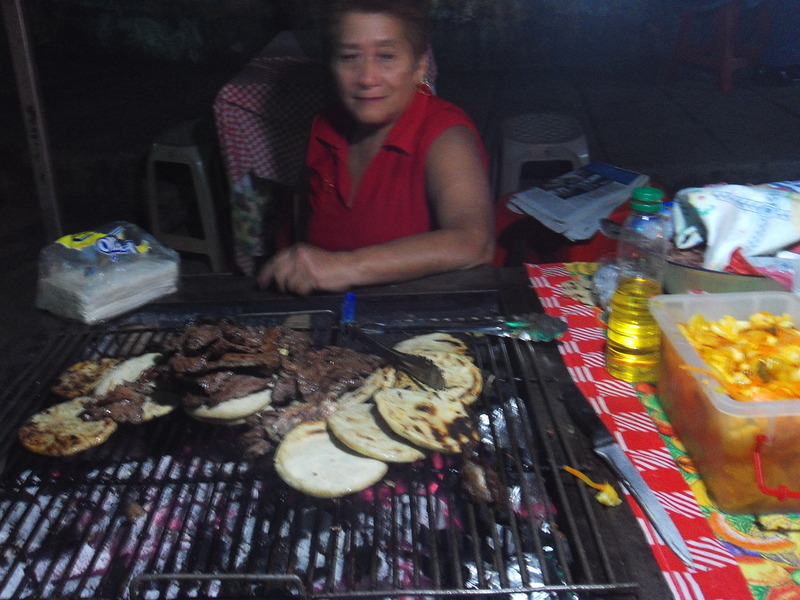 We spent one night in Quetzaltepeque, at a hotel for $6 a night that included a bottle of drinkable water, a bar of soap, a roll of toilet paper, and all our bedding and a towel. It was another small, untouristy town but with really friendly locals that me and Guy befriended in Central Park by hanging a hammock and lazing in the crossfire of some boys playing soccer. They were all really curious about us, and asked lots of questions in between laughing at our broken spanish answers and showing off their soccer ball juggling skills. When it got later and all the kids returned home, only one older boy stuck around to offer us bread from his parents bakery, and two elderly men, one with a pistol in his belt, stopped by to ask almost all the same questions as the boys just had. We had to leave the park at 11pm when some police came by and told us we were no longer in the right place at the right time, obviously skeptical of some long-haired blonde guy and gringa smoking cigars alone in a hammock. I was a little relieved to return to our hotel since just a few hours before, a massive cockroach had flown accross the park and landed on my right shoulder, so heavily that I thought it was someone putting their hand on me but when I looked over my shoulder, just saw his long tentacles dabbling over my neck. We were in Guatemala again, after a couple day visit to El Salvador, going straight through the sprawl of Guatemala city to charming Antigua. 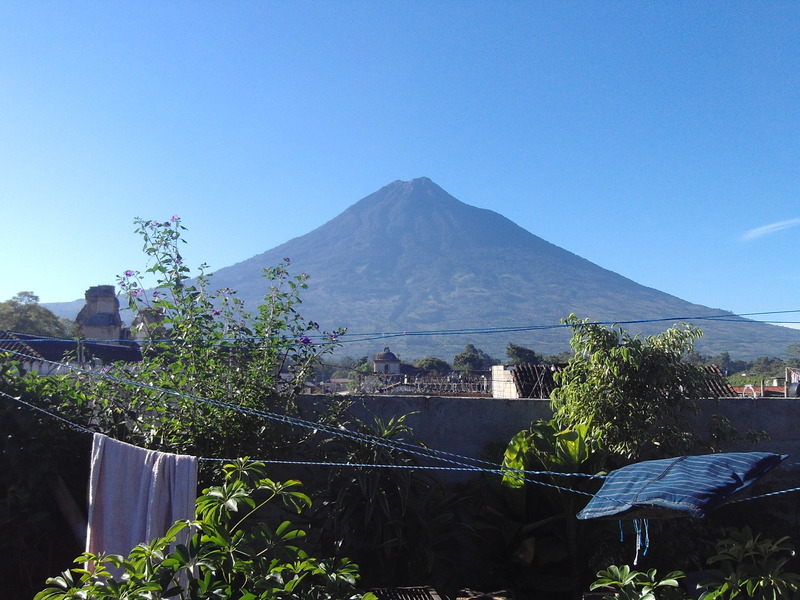 We stayed at the Yellow House Hostel, one of the cheaper choices in a plethora of options, with an amazing roof-top patio with views of all the surrounding volcanoes. 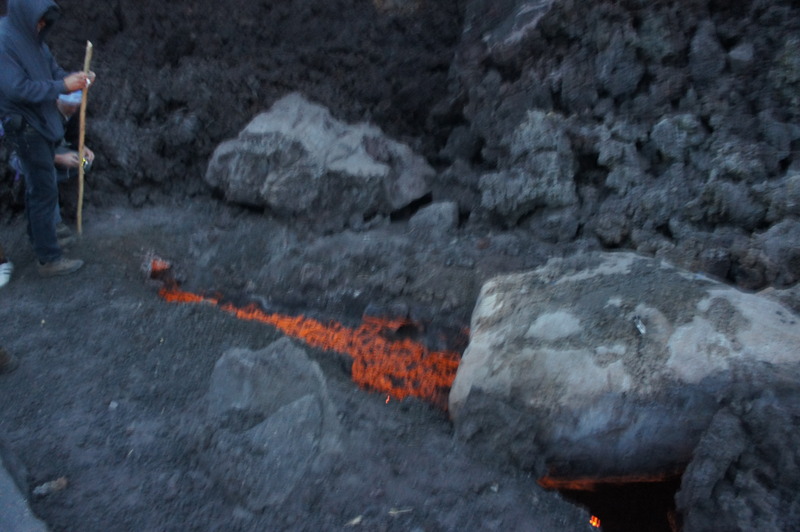 We hiked the popular Volcan Pacaya, and after a three hour hike through hot, new lava rocks, the lava flow we reached served as the perfect place to roast marshmellows. The market that you have to walk through from the bus terminal to get into town was one of the best markets I shopped at, full of hidden treasures to find. The way the Mayan people adorn themselves in delicately embroidered clothing makes everything very colourful, with their round eyes as their most prominent facial feature; they have big, bright eyes with black eyelashes that grow straight out from their perfectly curved eyelids. I saw one Mayan woman walking around town selling scarves who was totally albino, and I couldn’t help but stare since it was the most strange but beautiful sight to see someone who looked exactly like all the other Mayan women, but farer than everyone else even including the palest, European complexions. I spent a few days on Lago Atitlan, and wished I could have just lived there for a few weeks. Its a very serene, peaceful lake surrounded by huge mountains, and even though its predominantly populated by indigeous Mayan, a lot of tourists move there in search of a yoga-esqe, meditative retreat. 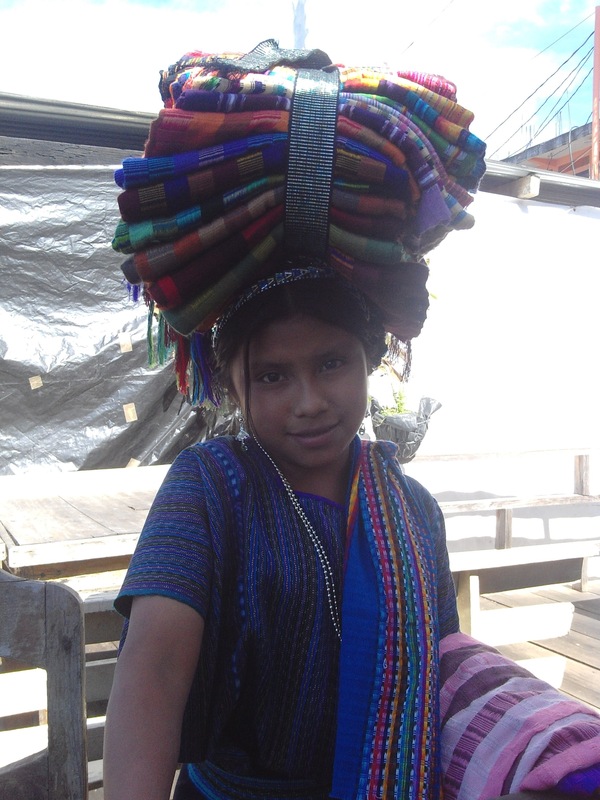 I really enjoyed interacting with the easy-going locals, my favourite being a 7 year old girl who barely spoke spanish, so instead spent her time teaching me words in her Mayan dialect, forgetting about the 10 pounds of merchandise she carried around on her head that she was supposed to be trying to sell to me. Many people believe the lake has some sort of healing power, and I think that if you believe it does, then it certainly has the capacity to heal you in whatever way you want. 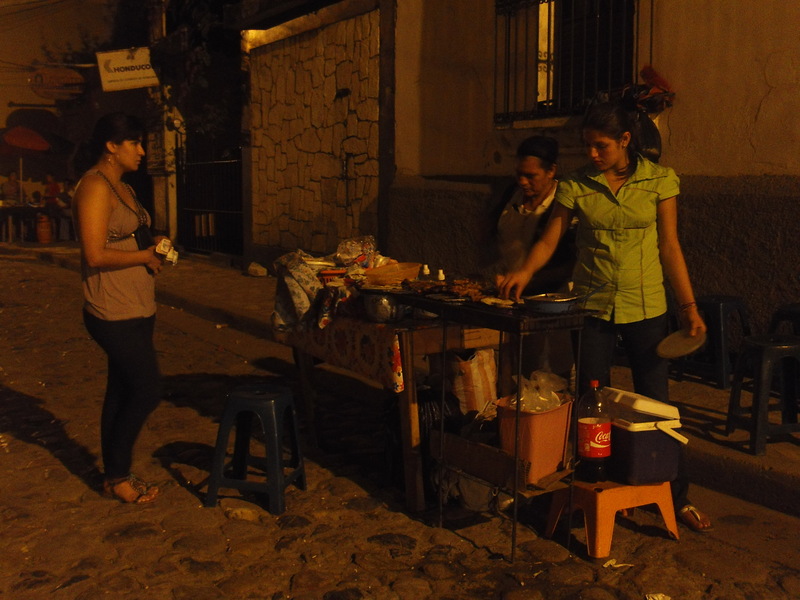 I only spent a day and a night in El Salvador but it left some great impressions. 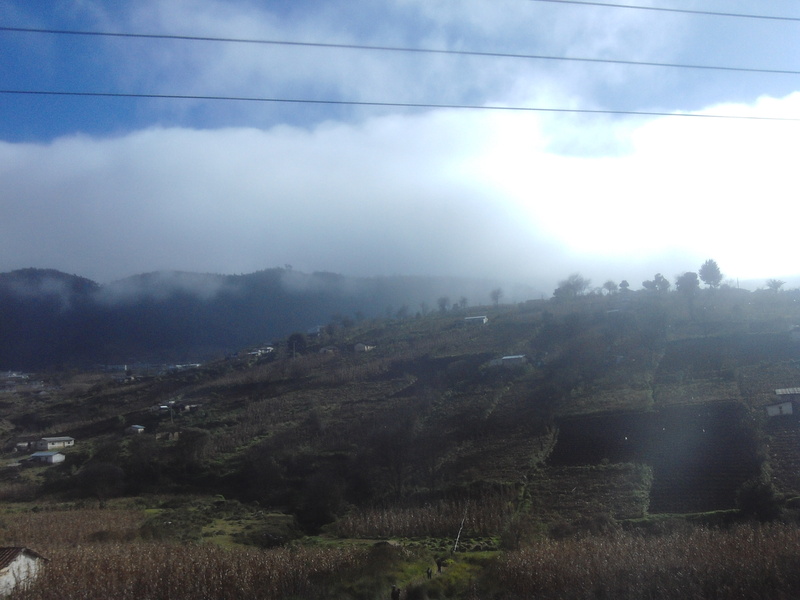 The people there seemed to be happier and friendlier than other places, and I regularly got taken aback by the fare complexions and lighter eyes of some El Salvadorians. The country changed all of its bank reserves into US dollars in 2001, abandoning the domestic colon for a more stable currency. One would think this change would make things more expensive, but even 9 years later, the government has kept inflation down enough that it would almost seem things are getting cheaper. Costs of things were more often counted in cents than dollars, with bus fares being between $0.24 – $0.75 for a long distance bus ride, and I bought some of the cheapest icecream I’ve ever seen at $0.10 for a one scoop cone. Internet was about half a cent per minute, so when five minute of internet use were paid for with a nickel, you would receive 3 cents change. That definitely calls for an appropriate time to tip 100% I’d say. We entered El Salvador at Frontera Anguiatu, and walked accross a very small bridge to start our bus journey to Santa Ana. We had a photo shoot there with our bus driver in his very pretty chicken bus, and carried onto Juayua, a very quaint, colonial town in the hills. The whole journey there and onwards was actually adorned with flowers all along the roadside, in full bloom boasting a rainbow of colours. My favourite natural wonder was our visit to Siete Cascadas, seven waterfalls just outside of town that you could walk between and swim in some. To get there you first had to take a three-wheel rickshaw along an unkept dirt road that I swore was going to tip the taxi onto its side with the 3 of us and bags crammed into the back of a very unbalanced, low-clearance, 2 horsepower engine vehicle. We made it there, for $1 a person, and hiked down the rocky path 7 minutes to the first swimming hole and enjoyed a refreshing dip in some of the cleanest water I’d seen yet. A local guy was scaling the moss covered, slippery cliff with his bare hands 10 m above the shallow waters and diving in, defying all laws of gravity and safety to pop back up and do it again, creating some thrilling entertainment for us all to watch in awe. I was happy with just dipping in and out, trying to make sure i didn’t accidently slip over the rock banks, but still got nervous trying to swim against the very strong current and trusting the man-made rock bank supporting the swimming hole. A consistent highlight has always been street food deliciousness – there are so many, wonderful, cheap eats that are almost always worth the risk of a sick tummy. Even the couple times I have gotten an upset stomach, I’m pretty sure its because of the unclean water that I drink involuntarily, in the form of ice, soups, coffee or water-washed fruits. Hygene isn’t great either, with the narrow, winding alleyways becoming the main garbage collection spot for all the grocers and food vendors while dozens of stray dogs linger nearby, waiting for an edible morsel of food to drop to the ground. One gentleman who sold me a $0.20 icecream cone had the sniffles and kept wiping his nose with the same hand he held the icecream in, probably thinking it was more polite not to hold out the snotty hand to take my money and give back change, but I’m not sure that was better than accepting the icecream from that hand. I love going into churches, since even the smallest towns have usually half a dozen, and the surrounding plazas and squares that are always full of local people, night life, or bustling markets. Shopping and bargaining those markets is an amazing sensory explosion, because you could never imagine more options of stuff for sale in such quantity, variety, or density. 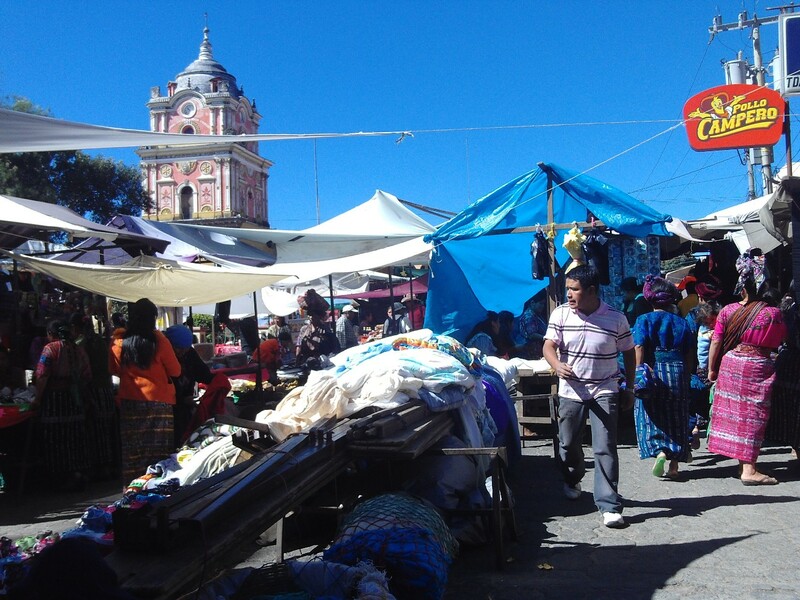 One Mayan market I went to in Solola totally covered every walkable inch of central park, and in one breath you could smell coffee, dried fish, barbequed meat, and chicken poo from the live chics being sold by the dozen. You could also buy grains, vegetables, pirated CD’s, cell phone accessories, leather products, individual razors or shampoo, and all all sorts of pretty cloth. All the new mothers carry their infant children in long pieces of cloth tied around their backs, keeping their hands free and their heads reserved for carrying baskets full of heavy items, and sometimes even live chickens and turkeys tied down and balanced ontop their heads, clearly suffering in the direct sun. 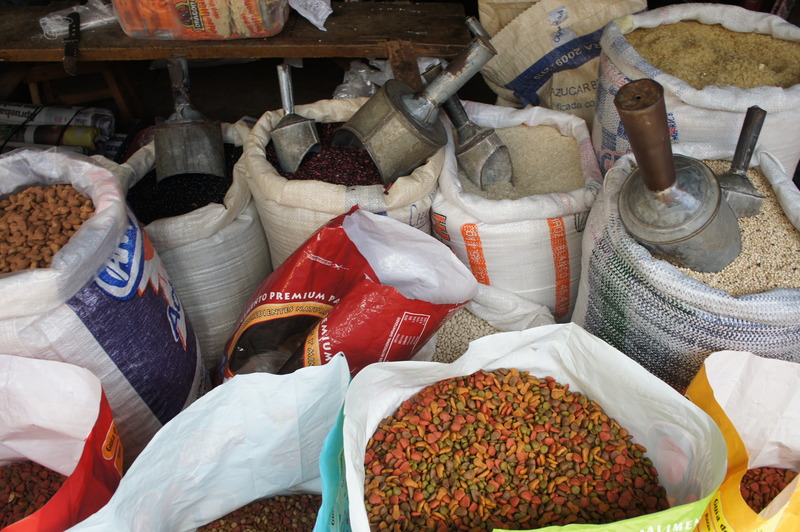 Shopping in the markets for your daily needs is status quo for most locals, and when there arent any franchise alternatives to getting your groceries then why not do it too. Even if I don’t need to buy anything, it’s just too interesting of an experience to pass up, since walking through any market will give you so many pretty things to see and smell, all the while guessing what half of the unrecognizable merchandise is. When you’re just learning spanish, it also doesn’t help to ask what something is, because of course they’ll respond what the spanish name of it is, and if I pride myself in knowing all the words for different colours and my ability to count, translating the name of an exotic fruit I’ve never seen or tasted just doesnt happen. One of those was nance – anyone know what the equivalent or comparable english description of that fruit is?